Four new boys joined the Home, early this month, so that there are now twelve resident boys at the FLA Home. Three of them were boys who had been visiting the Home/Centre from Oshodi and were interested in being supported, and the last was transferred from the Juvenile Welfare Centre (JWC), Alakara, following a home tracing carried out by Fair Life Africa, to the child’s former residence in Ibadan. JWC is a police run centre that takes in lost and found children, and links them up with rehabilitation homes or orphanages, depending on availability and ability to locate their families. The average age of the boys currently in the FLA Home is 15 (two are 13 years, and two are 16 years). Most of them were spotted at Oshodi, with two from Kuramo Beach. Almost half of the boys started their journey to the streets from Ogun State, and the rest are from Kwara State, Osun State, Ondo State, Oyo State and Lagos State. The boys in the Home all have one mind – they want to go to school. For many of them, the reason they give for running away, is that they have been denied access to this basic right by their parents or guardians. For yet others, they have never been to school, but desire to receive academic training above vocational, even if it means starting at a lower grade than is suitable to their ages. When asked what they want to be when they grow up, some aspire to be doctors, others accountants and lawyers. However, few of them are able to read or write well, and many have had to be placed in primary school, even though their ages suggests secondary education. Seven of the boys have been enrolled in a nearby private primary school, which offers subsidised fees for the less privileged. They started attending school on Monday the 22nd of October, after the procedure to transfer them into public schools proved slow and tedious, and meant that the boys were beginning to be weary and idle. The challenges related to this transfer is because most of them do not have evidence of past enrollment in school (being runaways) or have never been in school, or have been out of school for years, as well as the fact that government processes are inadequate. The remaining five were enrolled in a local private secondary school, with three of them entering at SS3 level, with the aim of sitting WAEC in 2013. Fair Life Africa Foundation was also given discounts by the school patrons to enable us to meet the tuition fees for the secondary school boys. For the confidentiality of the children, the school names have been kept private. The boys were all very excited to be finally going to school. They had received their school materials (school bag, books and stationary) earlier, and were desirous to put them to good use. They have shown dedication to study, and most of them have caught up with their notes already. Those is secondary school are using past questions to help them to prepare for their upcoming exams too. 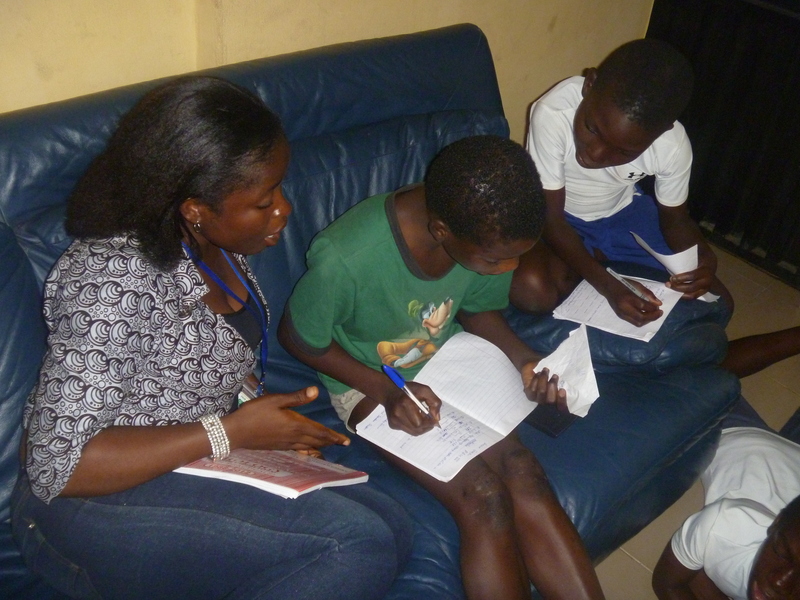 The support workers and social worker are supervising their study periods, with occasional assistance from volunteers who visit the Home to mentor the boys. The schools are also supporting our work with the children, by providing them with additional coaching free of charge, outside of school hours, to help them to catch up and get ahead with their studies. Even as the children study to catch up, they are counselled by their social worker, as work has begun for their eventual reconciliation with their families. The Home needs to purchase several textbooks for each of the children, so that they can keep up with their mates in school. The children also need black school shoes and white canvases for PE on Fridays. The Cobbler Store is partnering with Fair Life Africa Foundation to make basic black school shoes for all the children at a discounted rate. The children are in need of more clothes, shoes/sandals and underwear. These have been hard to come by, and many times, we have just had to buy. We would like to appeal to all our friends to please help us gather up old used clothes (in good condition please) that will fit teenage boys, which we can distribute to them. Even if you only have clothes for babies, girls and grown ups, that is also okay, because the children have family members, who also need these things. You can also help us to continue the programme by sponsoring a child with monthly financial donations. Please contact us to learn of ways to give or go direct to GlobalGiving UK or Guaranty Trust Bank (Fair Life Africa Foundation | 0106643687). Thank you for your support. We are glad to have you, Ifeoma!